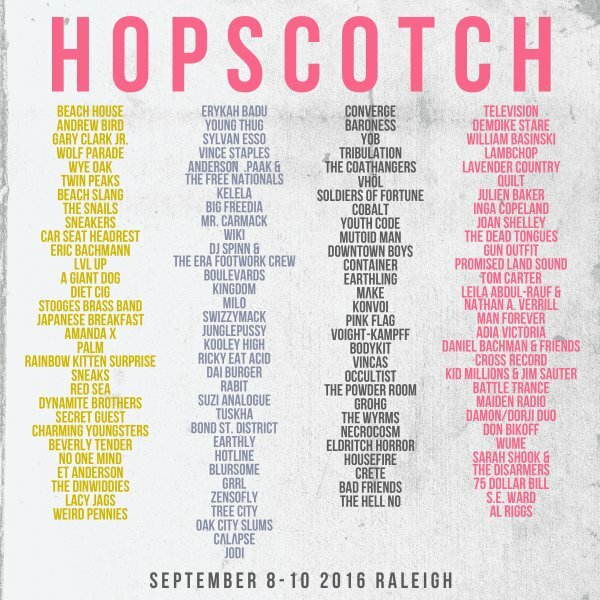 Raleigh, NC’s Hopscotch Festival just released their 2016 lineup, and it’s a never-ending scroll of goodness. What appears to be a list of every band touring this summer is actually those scheduled to perform, including headliners Television, Beach House, Erykah Badu, and Converge. Other standouts include Wolf Parade, Downtown Boys, LVL UP, Vince Staples, Kelela, Ricky Eat Acid, The Coathangers, Julien Baker, Andrew Bird, Car Seat Headrest, and many, many more. Hopscotch 2016 will take place September 8-1o at various Raleigh venues. Tickets will be made available Thursday, May 12. You can scroll the entire lineup here, or just look at the flier above.